“I suppose if I got another German Shepherd, I would want an older, trained female to mentor and play with Kahla.” This came out of my mouth before I’d thought about it. Oh dear. How could I pass up this opportunity, right? But how do I tell my husband? “Pebble, I have something to tell you that I know you are not going to like,” as we sat having our drink that evening. “Not another puppy?” he snarled. I took another sip of my drink. He took a gulp and waited for me to relate the story. After many phone calls back and forth with the breeder, he agreed to spay her there. 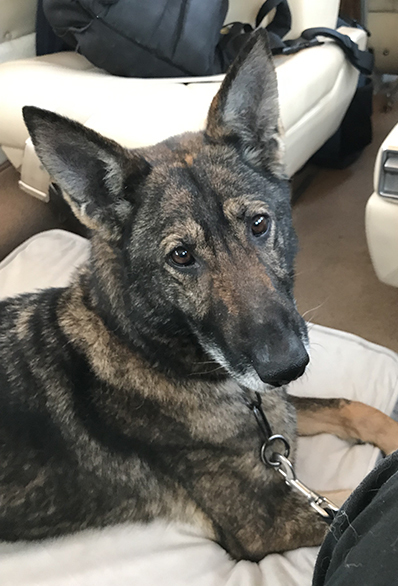 After her recovery and agreed plans to fly her from Seattle on Alaska Airlines for dog transport, my friend, Michelle, and I picked her up at Logan Airport, carrying treats, leash and a muzzle (just in case). No worry. She came out of the crate after a 10-hour flight with her tail wagging. Calm and quiet, she gave me a kiss as I bent over her. But, wait. Is this the same dog as the one in the photo I received from the breeder? Both Michelle and I scratched our doubting heads. “This dog has been neglected,” she said. I almost cried. What had I done? She was thin, and didn’t have the beautiful reddish and black coat that I was told she would have. Instead hers was dry and brittle and she scratched constantly, scattering hair into our faces and clothes. An odor accompanied her which we traced to her ears, full of crud. She was thirsty and hungry but had a sweet demeanor. My motherly instincts snapped to alert. On getting back to the car, she jumped right in as if this was routine and laid down on the seat. Occasionally I looked back, and raised her head, looking at me for assurance. I fell in love, again. Michelle and I had discussed and planned the scenario that would transpire when we introduced Elfi into the current menagerie of three. And my husband. But no matter how much scheming and planning, we all know the event would not replicate with perfection.